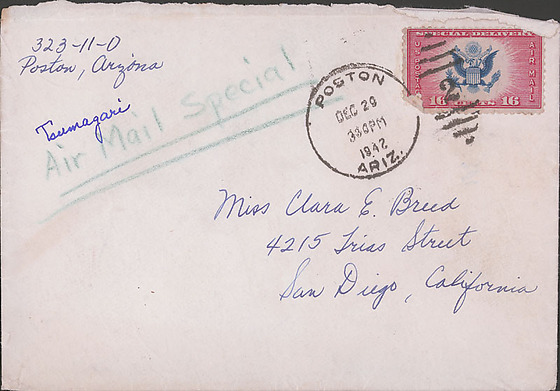 1 letter and envelope from Fusa Tsumagari to Clara Breed + Camp I library report. Camp 1. 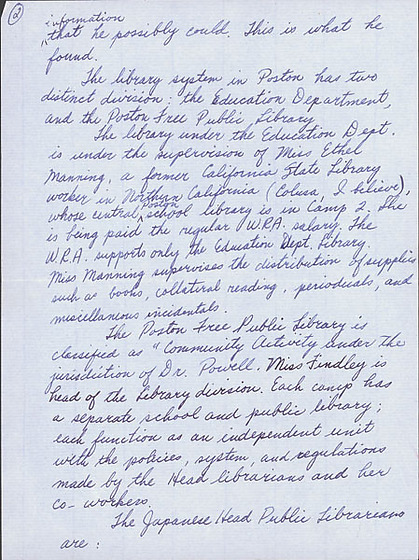 Mrs. Mabel Ota (of Holtville, Calif. a U.C.L.A. graduate--a very good friend of my sister)/Camp 2. Miss Yuriko Hasegawa/Camp 3. Miss Fumi Shiota/Since the W.R.A. 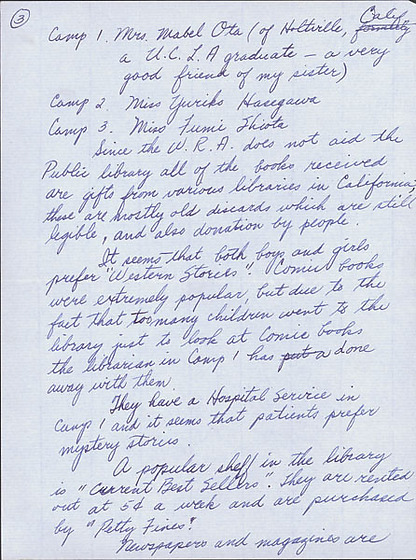 does not aid the Public library all of the books received are gifts from various libraries in California; these are mostly old discards which are still legible, and also donation by people./It seems that both boys and girls prefer "Western Stories." 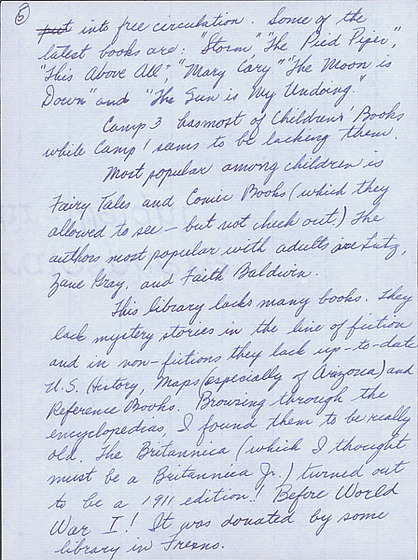 Comic books were extremely popular, but due to the fact that too many children went to the library just to look at Comic books the librarian in Camp 1 has done away with them./They have a Hospital Service in Camp 1 and it seems that patients prefer mystery stories./A popular shelf in the library is "Current Best Sellers." They are rented out at 5 c. a week and are purchased by "Petty Fines. "/Newspapers and magazines are donated by individuals who are subscribers. 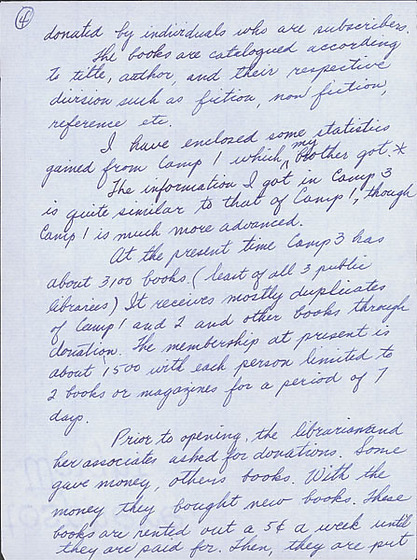 /The books are catalogued according to title, author, and their respective division such as fiction, non fiction, reference etc./I have enclosed some statistics gained from Camp 1 which my brother got. * /The information I got in Camp 3 is quite similar to that of Camp 1, though Camp 1 is much more advanced. /At the present time Camp 3 has about 3100 books. 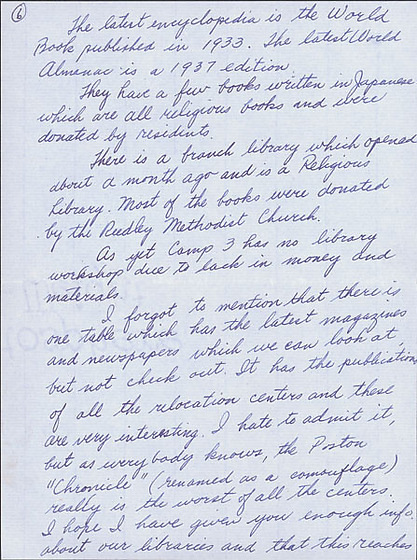 (least of all 3 public libraries) It receives mostly duplicates of Camp 1 and 2 and other books through donation. 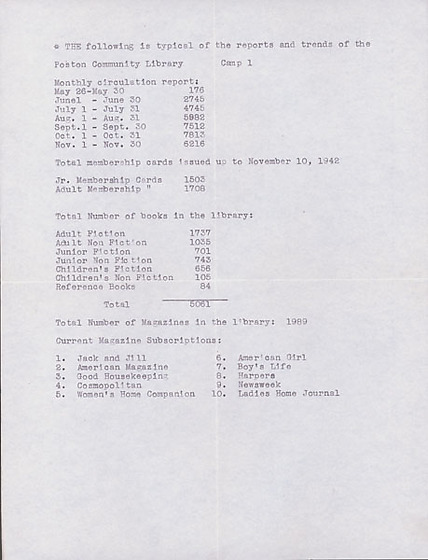 The membership at present is about 1500 with each person limited to 2 books or magazines for a period of 7 days. 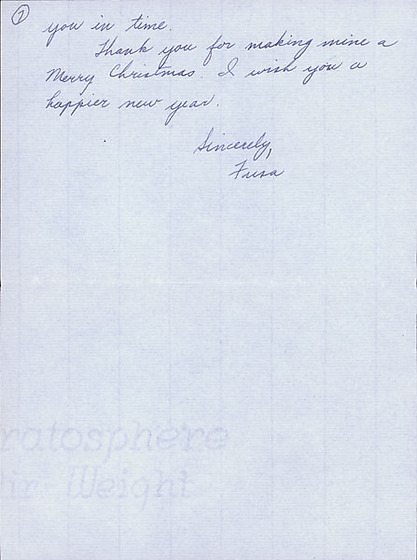 /Prior to opening, the librarian and her associates asked for donations. 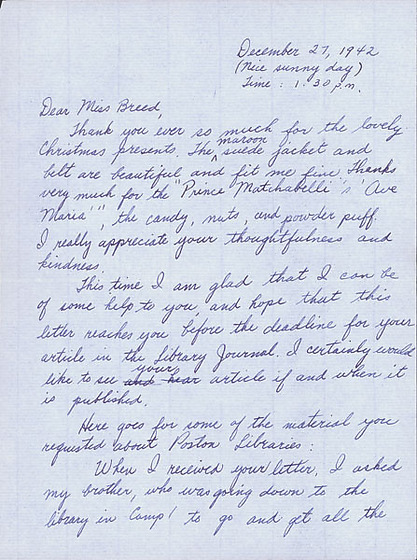 Some gave money, others books. With the money they bought new books. These books are rented out a 5 c. a week until they are paid for. Then, they are put into free circulation. Some of the latest books are: "Storm," " The Pied Piper," "This Above All," "Mary Cary," "The Moon is Down," and "The Sun is My Undoing."